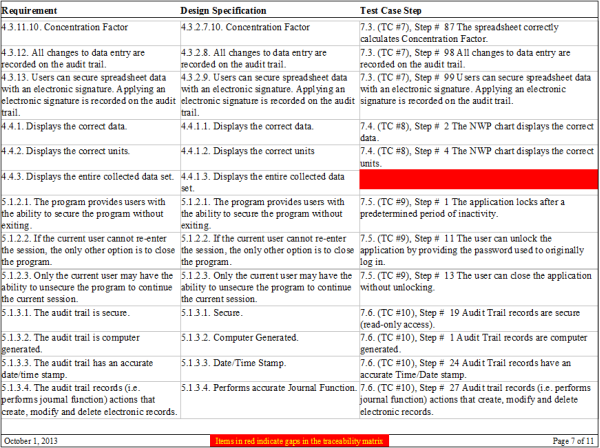 FastVal automatically generates a Requirements Traceability Matrix for all projects. When project requirements are defined, FastVal automatically begins generating the link between system requirements and corresponding test cases. FastVal users can link requirements to test cases or specific test case steps for even greater traceability. Any gaps in the FastVal traceability matrix are clearly displayed, both on the appropriate requirement and on the first page of the report. The traceability matrix updates automatically, even if the documents are edited. The Requirements Traceability Matrix links requirements throughout the validation process. The purpose of the traceability matrix is to ensure that all requirements defined for the system are tested in the test protocols. The traceability matrix is both a tool for the validation team to ensure that requirements are not lost during the validation project and for auditors to review the validation documentation. 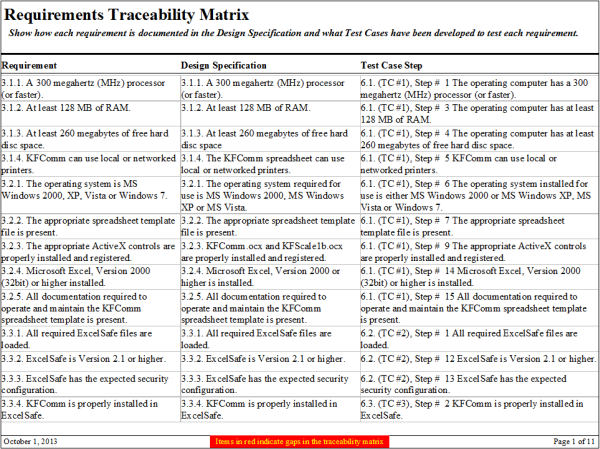 The FastVal Requirements Traceability Matrix provides an easy visual reference to see which requirements do not have associated specifications or test cases written. It also allows auditors to review the validation documentation to see how requirements are tracked throughout the validation project.